The householding spouse should be given a regular right over half of the income of the working spouse during the marriage and not after that. That is the due respect the householding spouses deserve for indirectly making the greatest possible contribution into the global business as a class without ever getting paid for it. The time has come to amend this everywhere by necessary legislation. Alimony should better be abolished as this is disrespectful to the dignity of individual. The globally distributed order of internet growth engine is expanding differently. Free families are running its free outlets. A family owning its house and domain, developing domestic entrepreneurship and homeschooling children to inherit all that, is a free family in the internet age. Such a family environ stays always free from the education and economy of displacements and never indulges in a wage slavery. Only a free family is absolutely free for doing utmost to their children by doing their best to humanity. They do so by running their homeschool as per actual requirements of developing their domestic entrepreneurship. SANGKRIT.net can license them a franchisee for developing own business since such a free family works well as Jeff Bezos’ two pizza team. Thereafter the head of such a family is called the ambassador of the globally distributed order of SANGKRIT.net and their house can work as free outlet of SANGKRIT.net selling its internet infrastructure, online support and global exposure worldwide. Fulfilling certain conditions is required and equivalent to the annual license fee, happy hours of online support spread across 365 days, are given to get used in developing own business in competition with the best in world. 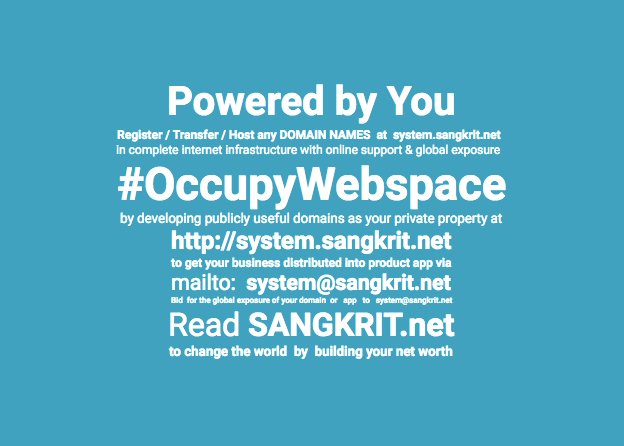 Anyone from anywhere can email to system@sangkrit.net to get involved. Free families make the most wonderful teams. They do have the sustainable kind of mettle that is necessary to bring down the plundering conglomerates across all the countries alike. Bringing and managing everybody’s business online is the biggest possible business of internet age. They could be doing the best just because system@sangkrit.net aggregates programming power from worldwide for distributing online support across all countries alike up to all their clients. The politics of displacement is causing most problems across all the countries alike. This has been imperial, colonial, savage, outdated and inhumane. Their untoward education and economy and overall law and order failures cause displacement of humankind and whenever such state failures are en mass, people become refugees. At SANGKRIT.net domestic entrepreneurship and homeschool make sustainable solutions by stabilizing human habitats. Internet age makes this executable in a world-class way. Let your children be very much sure about their business from the very beginning and become smartest in their own ecosystem of domestic entrepreneurship. Inhabitants make it everyday clean. Every time they themselves cook their meal. Nobody has to go anywhere outside looking for any education or employment when their consistency is made business-wise necessary for the whole world connected via internet. They live under no debt and deal with the whole world by their free will. Startup your own domestic entrepreneurship considering the capabilities of your home and family by registering your domain name at http://system.sangkrit.net today itself. This is going to make your family free from all untoward impacts. Avoiding all untoward education and untoward employment is necessary for the humankind to prevail. All civilizations can now be doing so in sync with Sangkrit.